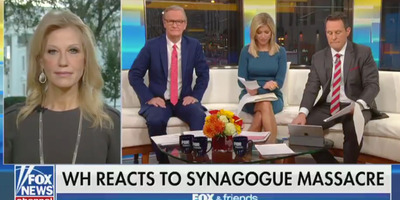 TwitterThe White House counselor, Kellyanne Conway, blamed ‘anti-religiosity’ for a massacre at a Pittsburgh synagogue. The White House counselor, Kellyanne Conway, on Monday said the massacre at a Pittsburgh synagogue over the weekend was motivated by “anti-religiosity” that she said was prevalent in the US. Saturday’s events at the Tree of Life synagogue in Pittsburgh marked the deadliest attack on Jews in US history. Federal prosecutors have filed hate-crime charges against the suspect in the attack, which left 11 people dead. But evidence from the shooting and law-enforcement data suggest Conway downplayed the issue of anti-Semitism in the US. Federal prosecutors have filed hate-crime charges against Robert Bowers, the suspect accused of killing 11 people in the Tree of Life synagogue in Pittsburgh on Saturday. Authorities said Bowers made anti-Semitic statements during the shooting. Bowers is also believed to have expressed deeply anti-Semitic sentiments on social media. Saturday’s events in Pittsburgh marked the deadliest attack on Jews in US history. Jews were targeted for religiously motivated hate crimes more than any other faith in the US in 2016, according to FBI data, and anti-Semitic incidents in the US tracked by the Anti-Defamation League surged roughly 60% from 2016 to 2017. Conway on Monday lauded President Donald Trump’s response to the shooting. In a separate interview with CNN, Conway said Trump could unite the country after Saturday’s synagogue attack, which followed a series of attempted bombings of high-profile Democrats, CNN, and other public figures. “The president is trying to heal the country,” Conway said. Trump has continued his attacks on political opponents and the media in recent days, even after the bomb scares and mass shooting.